Do you love idyllic parklands, peaceful waterways and unexpected views? If so, you may enjoy this return ride from Burnley Station. 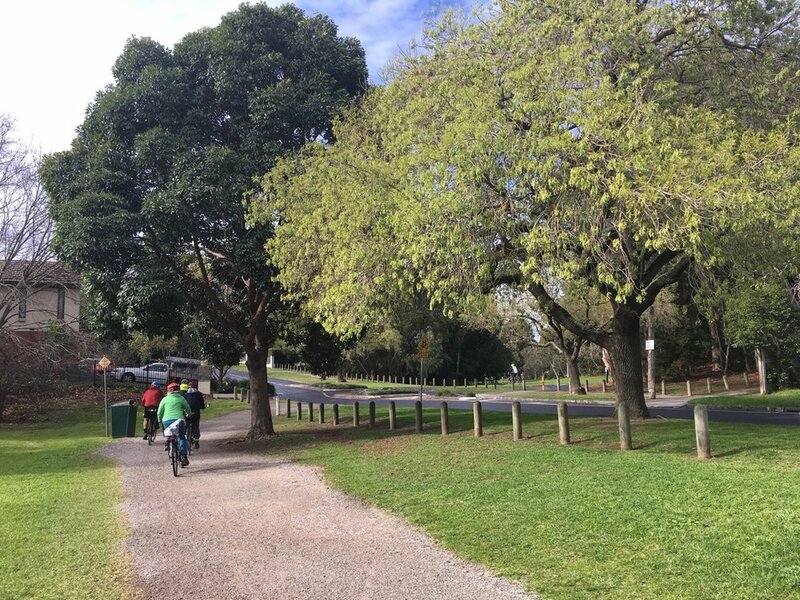 The ride follows segments of the Main Yarra, Ferndale, Anniversary and Gardiners Creek trails. Initially the ride swoops down away from busy Barkly Avenue before following The Boulevard. As you pass a noisy freeway exit, contrast this with the serenity of the river on your right. 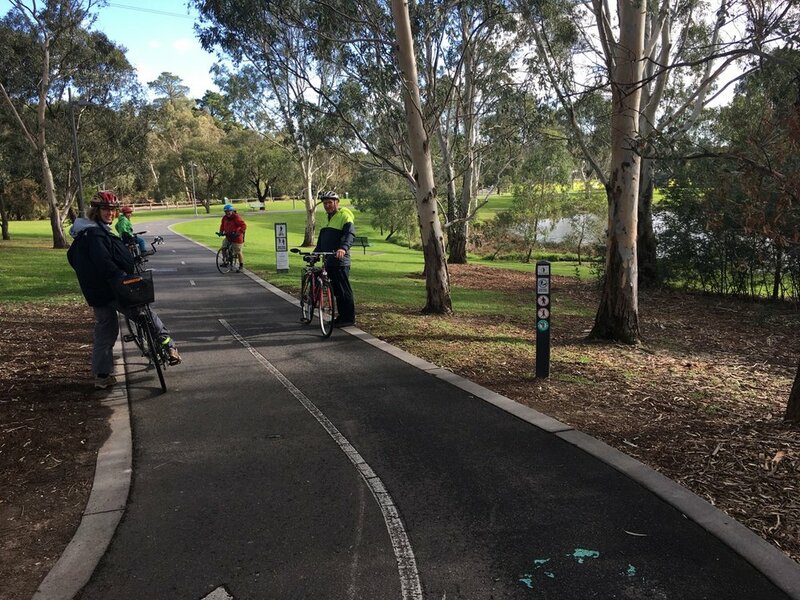 Turning onto Gardiners Creek Trail, admire the pedestrian bridge under the freeway before riding into the landscaped parklands of Hawthorn along the Creek. You may like to ride around the not-too-steep velodrome on your left and pretend you are an Olympian. Just after Tooronga Road is a path into some reeds – this is a section of Glen Iris wetlands, a piecemeal reserve that extends along the creek. A left turn takes you onto Ferndale Trail, a beautiful landscaped linear park with some impressive mature trees. The next leg is on the old outer circle railway line on the Anniversary Trail. Look right for views of the city as you ride on the old railway embankment. Turning back onto Gardiners Creek Trail, the parklands broaden and there is a lovely lake to admire in Dorothy Laver Reserve. Wetlands on the left of this reserve are worth a visit. Eventually you meet the turn off to Ferndale Trail and retrace your steps. on the Ferndale trail at Glen Iris Road, on the Anniversary Trail in High St Road Ashburton and on Gardners Creek trail near High St Road Glen Iris. There are toilets at Glen Iris Road and near High St Road Glen Iris. The terrain is gently undulating with one long gentle hill as you ride along the Ferndale Trail. Ferndale Trail is mainly well-maintained gravel. The rest is almost all sealed bike trail. Turning off the Yarra Trail. The ride starts on the south of Burnley Station in Madden Grove. Ride along Madden Grove keeping the railway line to your left. Just after Golden Square Park on your right, turn right into Gibdon Street. At the lights cross Barkly Avenue and go onto the footpath. Ride along the footpath to cross Monash Freeway. Immediately turn left onto the Main Yarra Trail. Ride along the trail until just after St Kevins’ boatshed, just before the trail goes under the freeway. Turn right onto Gardiners Creek Trail. Here the trail is on a bike/foot bridge suspended under the freeway. At the end of this suspended bridge, use the underpass to cross under Glenferrie Road and then turn left to go across Gardiners Creek (a concrete canal) on a bridge. Continue on the trail going under bridges at Toorak Road and Tooronga Road. Cross Bourke Road via a concrete tunnel. Soon after this, the trail crosses Gardiners Creek via an arched bridge. Turn sharp left onto the Ferndale Trail immediately after this bridge. Follow Ferndale Trail, crossing Dawson Drive and Glen Iris Road. After crossing Glen Iris Road, the trail continues next to the toilet. Follow the trail across four more streets to finish at Prosper Parade. Cross Prosper Parade and turn right onto the Anniversary Trail. Follow Anniversary Trail keeping close to the railway line until you pass Alamein Station. Use the lights to cross High St Road. The trail is now along the old railway track. Follow this down to meet Gardiners Creek Trail near a golf course. Turn right and follow Gardiners Creek Trail until you reach Ferndale Trail. You will cross two roads and several bridges over the creek. Retrace steps 1 to 11 to return to Burnley Station. riding into the city riding on the south side of the Yarra (for variety). Continue on Gardiners Creek Trail until you reach the Main Yarra Trail. Reverse steps 1 to 6 of South side of the Yarra, Capital City Trail East to reach Flinders Street Station. Follow steps 1 to 11 of Capital City Trail from MacRobertson Bridge, Capital City Trail East to reach Rushall Station. combining part of it with Anniversary Trail South (steps 20 to 33). At Ride Detail 18 above continue straight ahead instead of turning right.